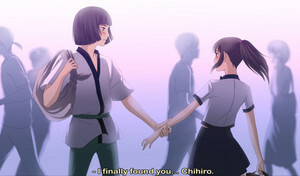 Chihiro & Haku. "I finally found wewe ... Chihiro." - Haku.. Wallpaper and background images in the Spirited Away club tagged: photo anime spirited away chihiro haku school meet again. "I finally found wewe ... Chihiro." - Haku.